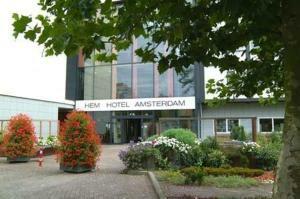 Hem Tourist Inn Amsterdam, Amsterdam discount hotels and accommodation. The HEM Tourist Inn Amsterdam** is perfectly located in the centre/west part of Amsterdam, only 5 minutes from the RAI Convention Centre, World Fashion Centre and World Trade Centre. Within 10 minutes you can reach the hotel from Schiphol Airport and the Amsterdam City Centre. The hotel is located next to the HEM Hotel Amsterdam.In the HEM Hotel Amsterdam you will find a cosy bar where we serve an a la carte lunch, a restaurant with a breakfast and dinner buffet, meeting rooms and a beautiful indoor garden. Parking is available on site. (Paid parking)The tourist attractions in and around Amsterdam can easily be reached by public transport or car. The reception will be pleased to help you to plan an excursion or give all the information required to make your stay unforgettable. View photos, room descriptions and make online reservations at Hem Tourist Inn Amsterdam. Save on room prices at Hem Tourist Inn Amsterdam, Amsterdam.